A list of cemeteries in the county in catalog number order, there are currently 234 cataloged cemeteries in the county. There are additionally 29 uncataloged cemeteries listed for the county. A link to the cemetery listing and a link to a USGS topographic map locating the cemetery are provided for each cataloged and relocated cemetery. A listing of cemeteries in alphabetical order by cemetery name (not available currently) containing the same information as item #2. A case study of 'Sayers Cemetery' a destroyed cemetery. Legal implications included. 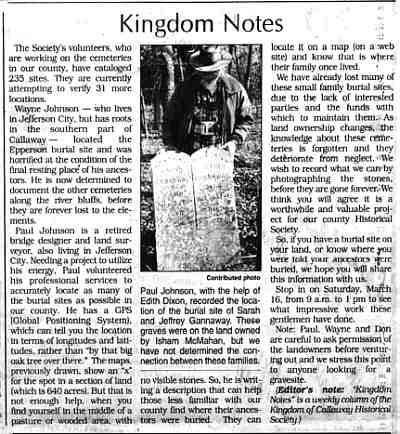 Some photographs of endangered cemeteries of Callaway County giving graphic evidence of the plight of our endangered pioneer family cemeteries. 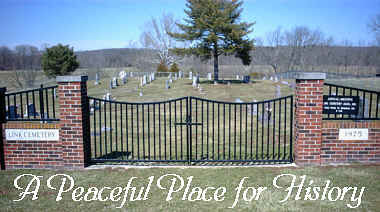 A clickmap providing the best links to cemetery listings for all of the 114 counties of Missouri. This page will provide you with links to all of the offerings related to the Cemeteries of Callaway County, Missouri. In the future we will be adding to the existing information, presenting as much information as possible related to the current situation of all of the known and located cemeteries of the county, as well as providing you with listings of the burials at those cemeteries as they become available. We hope to advise you as to how you can best see that the cemeteries of your ancestors are preserved and protected as well as assist you in finding the locations of those cemeteries. Additionally we are providing a large number of links to web pages with topics which are intended to aid you in your cemetery research. We hope that you find our new offerings useful in your quest for information. Readsville Area Cemetery - Miller Cem Oliver Cemetery - Montgomery Co.